Saga Dawa Festival is one of the three biggest festivals in Tibet. It begins in the 4th month of the Tibetan calendar and lasts for a full month to honor Shakyamuni Buddha’s birth, Nirvana (enlightenment) and Parinirvana (death). This is obviously a Buddhism Highlighted festival in Tibet. People celebrate the festival by going to temples, renewing Tarboche Prayer Flagpole, lightening butter lamps, turning the pray wheels, going to lingka, and burning sang. Tarboche Prayer Flagpole is a tall pole which are attached with many colorful prayer flags near Mt. Kailash. In every horse year in Tibetan calendar, numerous pilgrims around the world circumambulate Mt. Kailash. On the 15th day, most people gather around the Jokhang Temple to worship, prostrate and turn prayer wheels around Lingkuo clockwise. Sang is burning in the furnaces in front of Jokhang Temple from day to night and many people will continuously add more sang to keep the fire. It is forbidden to kill animals and eat meals during the whole month, especially on the 15th day. The festival is also the time people give things generously to poor people or beggars. So it is also called “The Poor’s Festival” or “Beggars’ Festival”. Visitors could also prepare some pocket money to give the beggars. Here you can follow this link to learn the Kailash Saga Dawa Festival Tour. 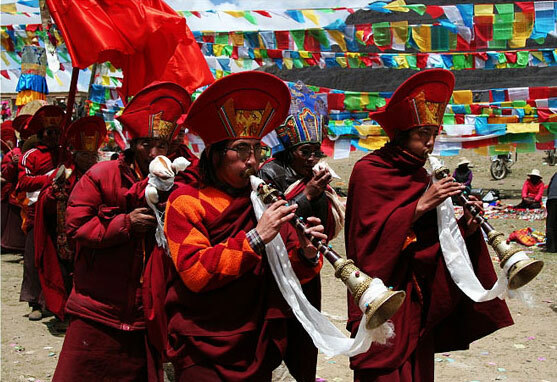 Read more Traditional Tibetan Festival.